Condition is Used. I acquired this clock missing hands and a convex glass. The dial has been scratched when it was in storage prior to my acquiring it. I replaced the crystal and hands. Data plate is brass and not aluminum like the newer models. Naval Observatory Western Union Self Winding Clock New York gallery wall clock. Condition is Used. Shipped with USPS Priority Mail. Case measures 16 x 16 x 5 glass is 11 inches excellent condition very retro. Probably 1930s 1940s. One was hanging in every western union branch in New York. Very important if purchased I will be away until Saturday 20 April and will not be able to ship until Monday. 22 April. Pdf: Engineering Dept., Self Winding Clock Co., 1945, with Instructions for installation and maintenance of sweep seconds clocks. Self -Winding Clocks as manufactured by the Self-Winding Clock C ompany 1908 -146 pages. Nice old oak case #81 SWCC clock. Standard size 80 beat oak case 38”x15.75”x7”. Wonderfull old oak case with normal marks from use but this one is really nice. Just look at those photos. Good dial with just a few scuffs. Seth Thomas Clock Oak Slave Clock. Condition is Used. Shipped with USPS Priority Mail.tested working I run with my 3 volt self winding clock !! This would be a nice find if you could make good use or are in need of a dial like this one.It displays quite nicely. These 1940s models were sold with installation and regular maintenance services. Antique 1940's Self Winding Clock Co. 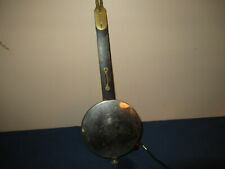 This oval style pendulum in very good condition The pendulum weighs 1 pound 6 ounces The overall length of this pendulum is 10 1/4 inches The width of this pendulum disc is 4 inches It retains its metal tarnished rod and can be cleaned up or left as found The adjustable rod works correctly as well. There are no signs of abuse or neglect I have other regulator clock parts as well and more not quite listed as of yet, please ask I have a store full of antique clocks & clock parts in my Ebay store. Up for your consideration is this pendulum or weight. As one would walk down the hallway to the main open room, the heartbeat of the building grew more intense. Everything we have is listed, so we do not have "other" parts in storage. These self-winding clocks were reltively expensive. IT IS A RARE BOOK AND MUST HAVE FOR ANY CLOCK COLLECTOR. ITS VERY INTERESTING BOOK TO READ AND TO HAVE IN THE COLLECTION. I took many pictures of the book for you to see and examine. I used to sit and look at my Grandpa's pocket watch for countless hours. I even tried counting the ticks for an hour, but I always ended up asleep. Color: Pearl. Features: Silver Stick Markers, Date Window. I used to sit and look at my Grandpa's pocket watch for countless hours. I even tried counting the ticks for an hour, but I always ended up asleep. Color: Pearl. I used to sit and look at my Grandpa's pocket watch for countless hours. I even tried counting the ticks for an hour, but I always ended up asleep. Color: Pearl. Features: Gold Markers, Date Window, Hands. Great colors - bright orange body with a yellow clock face and bells. It does have signs of wear including scratches and scuffs all over. This clock has not been tested, so I am not sure if it works. Clock is self winding, no batteries required. 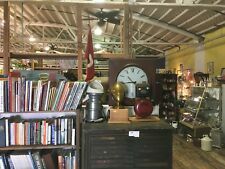 Antique Self Winding Clock Co., Oak Case, Parts / Repairs. Antique Self Winding Clock Co. Oak Case, Parts / Repairs. NOT WORKING, PARTS/REPAIR. Here is a recent estate find. This Has Batteries Which are Disconnected and Look Very Old. This Clock is Super Clean and in Great Condition, Sold Untested. This is Being Sold for Parts, Restoration, or Repairs! 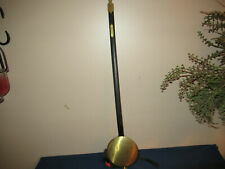 This pendulum is in good condition. This is being sold for parts or repair. See photos for more details. I will answer to the best of my knowledge. This is being sold for parts or repair. See photos for more details. I will answer to the best of my knowledge.